Word has it there's a group of young and enthusiastic graphic designers on the east side of Austin making wonderful things like this comforting and lovely poster (available in their School Supplies section). 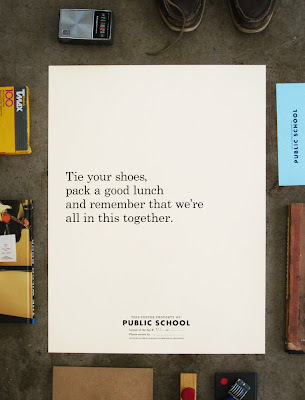 Public School is a group of creative folk working on the east side of Austin together, yet not together. The same studio, different professions. Similar tastes, varying favorite Bob Dylan song. Consistently unified love for the Mexican food on the east side of town.